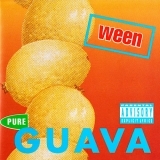 Pure Guava is ranked 5th best out of 20 albums by Ween on BestEverAlbums.com. Members who like this album also like: The Mollusk by Ween, Chocolate And Cheese by Ween and The Pod by Ween. Related links: top tracks by Weentop tracks of the 1990s, top tracks of 1992. Showing latest 5 ratings for this album. | Show all 88 ratings for this album.